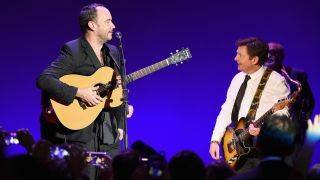 Actor Michael J Fox joined Dave Matthews on stage for a performance of All Along The Watchtower. The weekend show at the Waldorf Astoria in New York City was part of the Michael J Fox Foundation’s A Funny Thing Happened On The Way To Cure Parkinson’s gala. Fox, 55, was diagnosed with Parkinson’s disease in 1991 and has been an active advocate for research towards finding a cure for many years. Watch footage of him performing a version of Bob Dylan’s All Along The Watchtower in the video below. Fox famously played Chuck Berry’s Johnny B Goode in his role as Marty McFly in Back To The Future. The Dave Matthews Band have a number of tour dates coming up, including a performance at the Stand With Standing Rock event in Washington DC on November 27. Neil Young last weekend showed his support for the protests against the controversial Dakota Access Pipeline.